Wow. 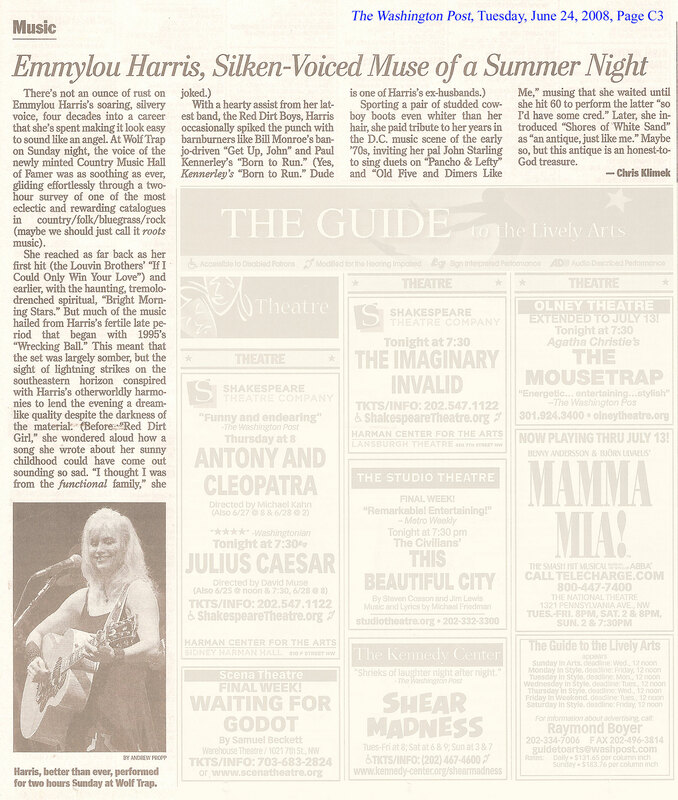 It appears that the last time Emmylou Harris played at Wolf Trap, in 2008, I tried to corner the market, penning a a review of her then-most-recent album for the Washington Post as well as a Post review of the concert and a profile for The Examiner that I can’t find a link to now. I used to have it on this site as a PDF, but then Apple discontinued its .Mac service. It’s the circle of life, I suppose. Anyway. Emmylou was at Wolf Trap again this week, co-headlining with her fellow 65-year-old John Prine. Once again, she invited her pal and (she said) favorite singer, John Starling of the Seldom Scene, to perform with her. And once again, I covered the show for the Post. This entry was posted in Uncategorized and tagged Emmylou Harris, John Prine, pop music, The Washington Post, Wolf Trap. Bookmark the permalink.